The former chief executive of the failed Connex South Eastern franchise has said he was not given enough time to improve the service. Olivier Brousse made the comments on BBC South East Today on Thursday, four days after Connex handed back its franchise to the Strategic Rail Authority (SRA). The handover on Sunday 9 November at 0200 GMT was seven weeks ahead of schedule. Mr Brousse admitted Connex had not provided a good enough service but said: "By 2004 we would have introduced all of the new trains in place of the old slam-door carriages. "The commuters would have seen we had achieved what we were trying to do." Concerns about the company's financial mismanagement led to the SRA announcing in June that the franchise would be terminated early. Mr Brousse denied all allegations of financial mismanagement and said the SRA was wrong to cite this as the cause for the termination of the franchise. The SRA subsidiary, South Eastern Trains, is now babysitting the service until a private firm is found to take over the region's services. 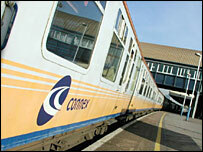 Connex won a 15-year franchise deal when the British railways were privatised in October 1996. Europe's biggest private rail operator ran into difficulties managing the 182 stations, 1,700 daily train services and 120,000 passengers each day travelling through Kent, Sussex and south London. The French-owned company's services were hit by long delays and cancellations. The new managing director Michael Holden, former Connex South Eastern managing director, has said he will fight to turn around the track record of failure. At the weekend he said: "My plan for the next 12 months is simple: to get it right, first time, more often."